Chant rings out around the Red Star Stadium ahead of 2-0 win for the hosts. Red Star Belgrade fans treated the crowd to a rendition of “F*** you, Liverpool” ahead of kick-off in their Champions League clash with Liverpool on Tuesday. An intimidating atmosphere at the 53,000-seater Red Star Stadium in Dedinje awaited the visitors, who were defeated in a shock 2-0 result despite the Serbian side only having 28% of the possession. 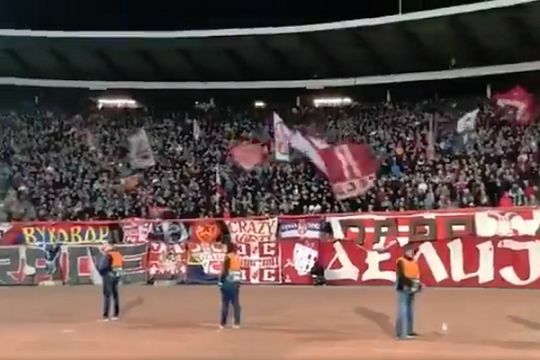 Attempting to give Vladan Milojević’s team the maximum possible advantage, the home fans in the main stand behind the goal were conducted through the offensive chant as the players warmed up on the pitch. The conclusion of the song was greeted with a warm round of applause.